The Mezz Box project overlooking Victoria on the River Park in Hamilton, has won a national Excellence in Steel Award. Hamilton-based structural steel contractor Waikato Steel Fabricators and engineering consultants BCD Group took first place in their category for The Riverbank Mezz Box at the recent Steel Construction New Zealand's (SCNZ's) Excellence in Steel Awards. 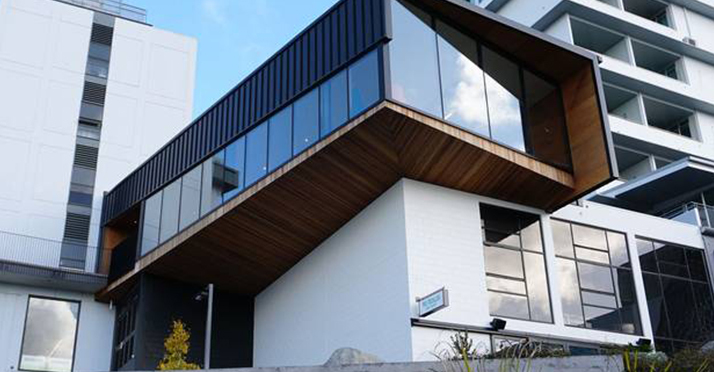 Clinging to the Riverbank Lane building The Mezz Box, a creative studio, is cantilevered towards the Waikato River beside Victoria on the River Park. The judges said it is a fantastic rejuvenation of an existing building. The project was entered in the under $500,000 category. "An iconic and exciting structure, the outcome is deceptively simple and contributed to the revitalisation of this part of Hamilton," the judges' said. The annual awards celebrate the best and the brightest in the steel industry and acknowledge commitment to innovation, quality and collaboration. SCNZ chairman Wayne Carson said: "The awards showcase the best of our industry ... yet, in the midst of the current construction boom, there have been multiple reports of construction projects faltering, too often as a result of poor quality and poor procurement decisions, which has seen product imported from offshore sources." Mr Carson said SCNZ's focus on compliance is a credit to the local structural steel industry. In another win for Waikato Steel Fabricators, employee Sean Carroll was named Apprentice of the Year. Company director Gary Lightfoot said: "Sean's success is a reward to our company for our commitment to apprentices — it's something we've been doing for the past 18 years. We are thankful to SCNZ for creating this environment to acknowledge these young people. "It's something we can be proud of as a business and as an industry."